There is no oversight on how Swaziland’s King Mswati III, his fourteen wives and vast royal family spend public money. In Swaziland the King’s word is a proclamation. Once he speaks nobody is allowed to question him. Media in Swaziland have access to the full budget estimates which contain information about the King’s budget but do not publish it. State media in the kingdom are heavily censored and the private media censors itself when reporting about the King. The source of much of King Mswati’s income remains a secret. In 2009, Forbes magazine estimated that the King himself had a personal net fortune worth US$200 million. Forbes also said King Mswati was the beneficiary of two funds created by his father King Sobhuza II in trust for the Swazi nation. During his reign, he has absolute discretion over the use of the income. The trust has been estimated to be worth US$10 billion. In August 2014 the Sunday Times newspaper in South Africa reported King Mswati personally received millions of dollars from international companies such as phone giant MTN; sugar conglomerates IIIovo and Remgro; Sun International hotels and beverages firm SAB Miller. The newspaper also reported that the King was receiving income from Tibiyo TakaNgwane, which paid dividends in 2013 of R218.1 million. The newspaper reported ‘several sources’ who said it was ‘an open secret’ that although money generated by Tibiyo was meant to be used for the benefit of the nation, Tibiyo in fact channelled money directly to the Royal Family. 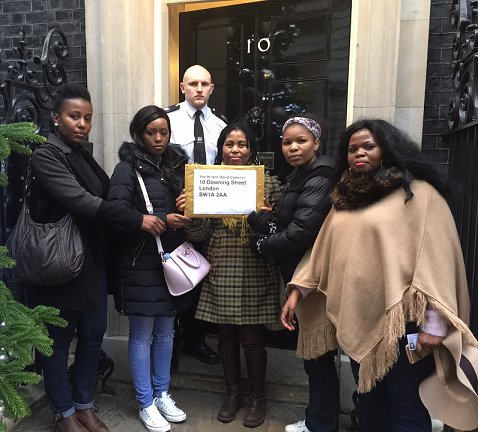 Exiled SWAZIS are presenting a petition to 10 Downing Street in an attempt to ensure that the Commonwealth take action against KING MSWATI III to allow for democracy and respect of human rights in Swaziland. A letter accompanying the petition thanks David Cameron for his recent promise to push for democracy in Swaziland. 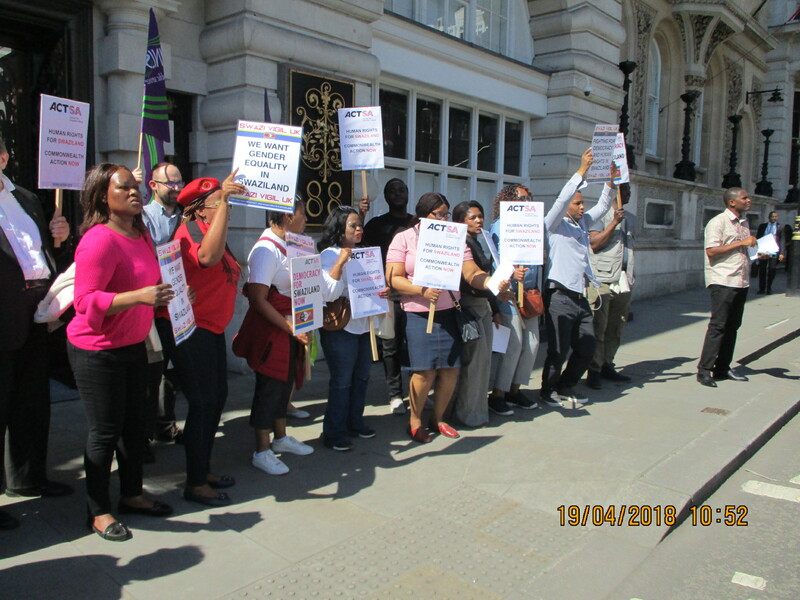 The petition has been signed in the past 3 years by more than 10,000 people from all over the world who have passed by the Swazi Vigil, which has been held outside the Swaziland High Commission in London every Saturday for the past 5 years in protest at human rights abuses. 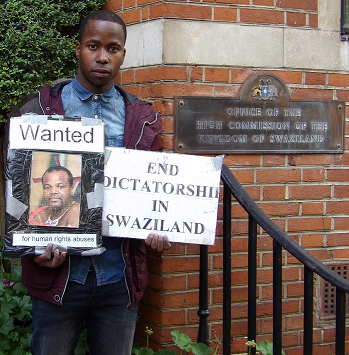 The Vigil fears that King Mswati III will continue to imprison, torture and kill activists in Swaziland if there is no democracy. 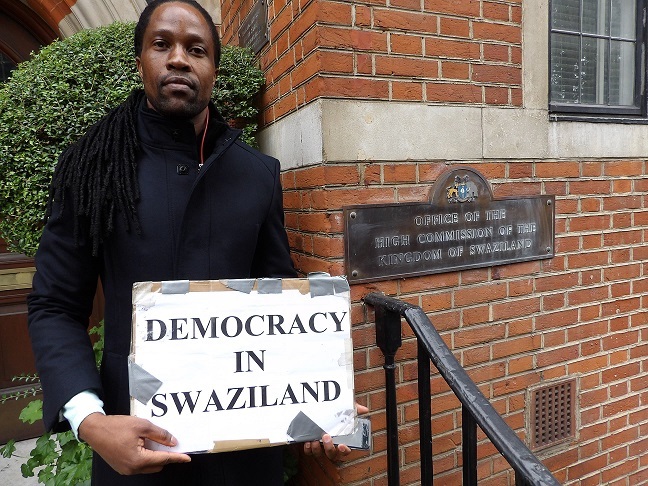 Before the petition is handed over, the Vigil and supporters of the Swazi vigil will demonstrate outside 10 Downing street, with the singing and drumming. The African Growth and Opportunity Act, or AGOA is a legislation that has been approved by the U.S. Congress in May 2000. The purpose of this legislation is to assist the economies of sub-Saharan Africa and to improve economic relations between the United States and the region. The legislation authorized the President of the United States to determine which sub-Saharan African countries would be eligible for AGOA on an annual basis. The eligibility criteria was to improve labour rights and movement toward a market-based economy. Each year, the president evaluates the sub-Saharan African countries and determines which countries should remain eligible. It is no surprise that Swaziland has failed to comply with these rules. A press conference due to be held by the US Embassy on Monday (19 May 2014) to make the announcement was called off at the last minute. No reason for the cancellation or alternative date for the announcement was given. The United States had given Swaziland an ultimatum to implement the full passage of amendments to the Industrial Relations Act; full passage of amendments to the Suppression of Terrorism Act (STA 2008); full passage of amendments to the Public Order Act; full passage of amendments to sections 40 and 97 of the Industrial Relations Act relating to civil and criminal liability to union leaders during protest actions; and establishing a code of conduct for the police during public protests. They failed to implement any change. On 1 January 2015, the US President Obama issued a proclamation removing Swaziland from the list of sub-Saharan African beneficiaries that receive duty-free access to U.S. markets under the U.S. African Growth and Opportunity Act (AGOA). Some observers fear that Swaziland’s exit from AGOA will have a profound impact on the country’s economy, which is already experiencing close to 40 percent unemployment. A number of experts have credited AGOA with helping to boost the Swazi garment industry; however, without preferential U.S. market access, the industry is expected to contract, resulting in the loss of approximately 17,000 jobs, according to one official from the Federation of Swaziland Employers.